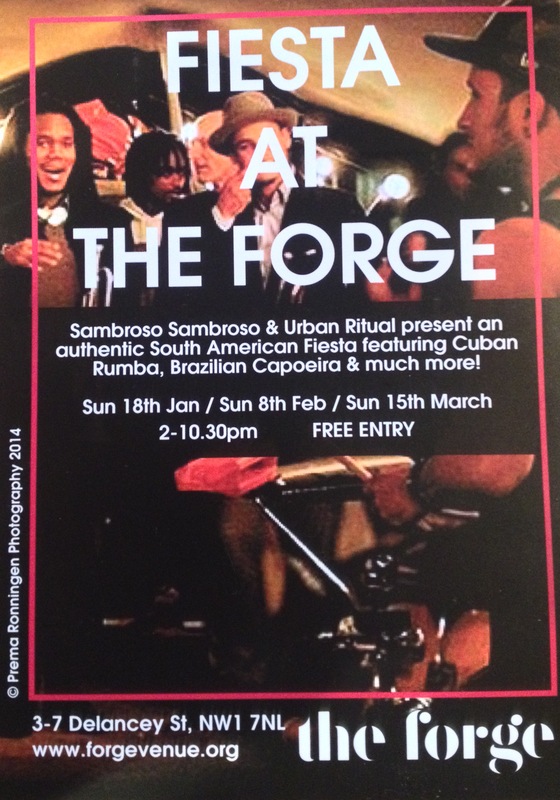 Sunday at the Forge in Camden was the first ‘Fiesta at the Forge’ put on by Sambroso Sambroso & Urban Ritual bringing traditional Cuban food, Cuban Rumba, Brazilian Capoeira & much more into the north London venue. I arrived in time to have some food (which was righteous! 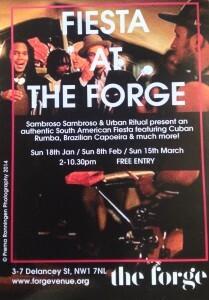 Cassava, beans & plantain) before Gerardo de Armas & Su Rumbache stepped up to perform. These are a very traditional sounding Cuban outfit heavily percussion based and vocal lead - “renowned rumba master and ex- Yoruba Andabo singer Gerardo brings us the UK’s top Afro-Cuban folklore ensemble, a high-energy explosion of dancing, drumming and singing that will take us back to the roots of Cuban music.” ELI & LA EVOLUCION – “known in the Latin scene as the sister band of Cuba-London musical revolutionaries WARA , it’s the same musicians, same songs, same energy, but re-packaged in solid quality Cuban timba flavouring for all the salsa dancers and hip-shakers.” If you joined us at Rhythmtree for the Saturday last year the chances are you will have seen Wara in action. 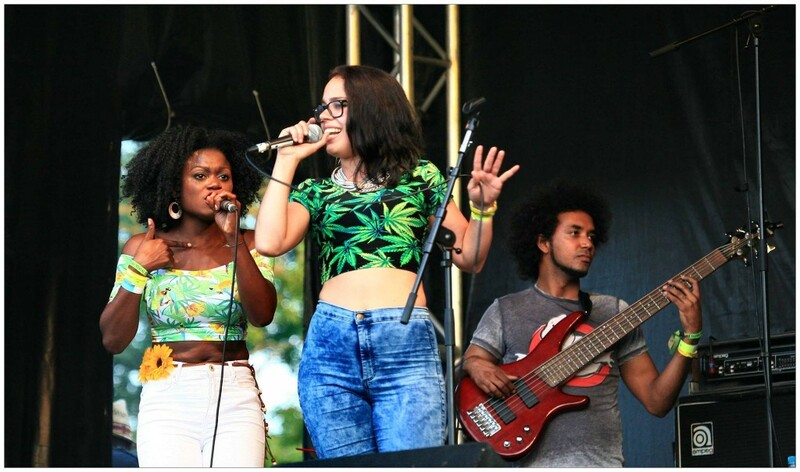 Wara are a high energy and extremely tight UK/Latin outfit who fuse the sound of Cuba and London together while drawing inspiration from a variety of other styles such as hip-hop, funk and jazz. Eli & La Evolucion (as it says above) are known as the sister band of Wara. They are the same musicians, again performing with extremely high amounts of energy, in a heavier cuban style while still drawing inspiration from genres such as funk & reggae. The set featured a cover of Stevie Wonder’s Superstition which transformed the song into an explosion of cuban funk, enough to get my father up out of his seat, as well as a couple of tracks they would normally perform as Wara and a variety of other musicians stepping up to perform with the band throughout including a Cuban trumpet player called Yelfris Valdes who absolutely blew my mind… The vibe of the whole event was amazing. The crowd lively, happy and inviting, the music incredible and all helped by the Forge being a fantastic venue – both looking and sounding great! The next ones are taking place on the 8th of February and the 15th of March, see you there!